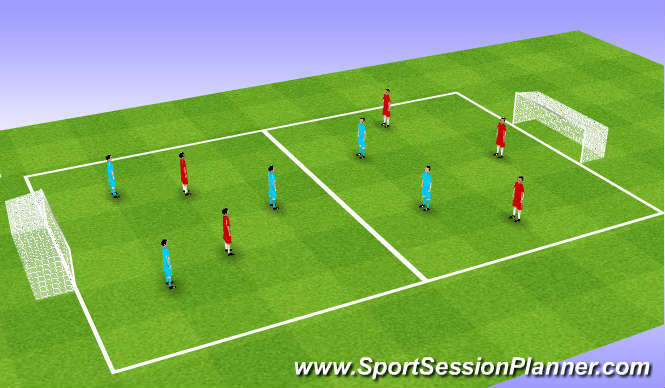 Each player must touch ball at least once ball moves in clockwise direction. 3v2 passing to opposite square keep ball until passing option is good. (game) Pass ball to striking pair and one player supports to make 3v3 one touch finish. Passing, reciving in side outside of feet. Dribbling. Short, sharp, sprints. Body strength to hold ball back to goal. communication, willingness to make unselfish runs. First two sessions were brisk with good interlink of play. did well retaining posession on overload play but struggled to break down defence when 3v3. need to be cleverer sharpe movement.